A group of young adults are being systematically attacked while hiking in the woods of eastern Canada. But more intriguing even than the horror of the attacks is what is attacking them... Horrid 'alien' monsters threaten to kill them all unless they can reach the safety of a log cabin owned by one of the teens. And as the body-count escalates, it becomes worth considering whether monsters can be... human as well as 'alien'. 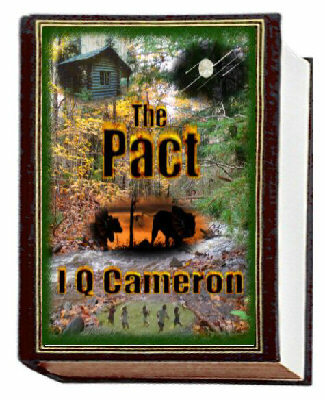 The Pact is a killer-thriller, set in the wonderful scenery of eastern Canada (Nova Scotia), and while it is loaded with thrills and spills, death and mayhem, twists and plenty of suspense, it also carries a deeper, hidden message about matters that affect us in our time. This tale is partly allegoric, and therefore poses a timely warning to us all... The Pact also offers a look into the Christian message, as portrayed by various characters within the story, and allows the reader to consider the power and grace of God, even in horrible, life-threatening situations. will survive? The Pact is loaded with humour, and offers clear, concise and sometimes surprising descriptive content for your enjoyment and... pondering. What horrendous things would an alien do to a young woman? They gave him no warning… the thing had him by the throat in the first few seconds. Two dark, black monsters. Monsters with awful teeth. And a mission to kill. They came from nowhere, made little or no sound sneaking up on him, and showed him absolutely no mercy. In the agony of body and mind, he had time to see their dirty stained teeth, and even smell the filth of their excited breaths as they tore him apart. And was that his liver? So nice, she thought. Such... comfort. Even the touch against her skin... Against her throat... And the immaculate, indescribable pleasure of the body that came to rest over hers... Strangely and indescribably intimate... the dark monster… began to apply pressure to her slender, sweat-dampened throat… driven by a deep, animal instinct that she could actually feel emanating as he had his undisputed way with her. For now the prowling beast was satisfied. But even he understood; that would never last. Tingling excitement over the thrill of his kill told the wild beast that his desire for more life and more blood would not need to remain repressed for much longer. Indeed, such a desire could not be repressed any longer! Skulking about in the shadows would soon no longer be necessary. When the beasts attacked, they came with speed… They were vicious, fast and utterly bent on a coordinated goal. As if under some unseen, controlling direction… they raced toward their prize, teeth half-bared, their gaping mouths snorting dog-like snarls as they tore across the open ground for all to see. Clearly there would be no more hiding from their prey. ?? ?’s face was intense with terror, pain and anguish. “And you’re just gonna complain right to the end,” he added… with flippant sarcasm. ??? grinned as he released and adjusted his grip on the handle of his knife… The blade… was entirely hidden from view, buried on an upward angle inside ?? ?’s chest, which had gone from heaving a moment before the blade’s intrusion, to small, rapid spasms accentuated by almost incessant trembling. With that he ran hard at the… girl, his spear held level and gripped firmly with both hands. And with a loud, victorious shout he ran ??? right through the centre of her chest with it. And unlike the aliens’ armour, his spear didn’t glance off this time. … it was only when the eerie visitor finally raised his head, that ??? slowly began to understand. … unhurried as if he was actually enjoying finally being able to reveal himself to the terrified, traumatised teens… moved... so as to fully reveal his face for all to see. Each of the teens made their own individual and fitting gasps and sounds of shock and surprise. And of the beginning of understanding. Their eyes met, and neither moved for some time as ?? ?’s lower lip quivered. Yet now, clearly, God had used her small witness to her friends to lead most, if not all to Himself before they died. Perhaps not His desired plan for the group, ??? knew, but His ability to save the souls of her friends, even despite her own disputable presence on the hiking trip, served only to show how fully God was in control of the situation. She had no control at all. God was clearly in control. She just hadn’t seen it, until now. And He loved her. Completely. Absolutely. Purchase the absolutely gratifying conclusion to The Pact.